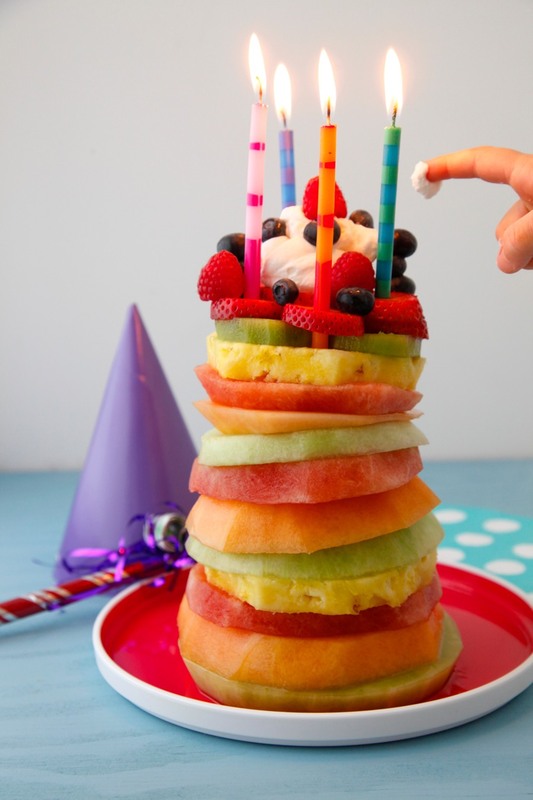 When it comes to my birthday I prefer to keep things simple, and so this Fruit Tower Birthday Cake fits the bill perfectly for me. Sure I love a baked Tres Leches Cake and Chocolate Chip Cookie Cake as much as the next gal, but there's something so straightforwardly beautiful and natural about this cake made entirely of sliced fruit. And since my birthday and Mother's Day fall on consecutive days this year, it might not be the best idea to have a rich cake two days in a row (or maybe it is? Wait, I need to ponder that a bit more.). A Fruit Tower cake is another story entirely. Layered with naturally sweet and juicy fruits like pineapple, honeydew, mango, cantaloupe, strawberries and basically anything else that's in season, it's a dessert that's as beautiful as it is delicious. And need I mention that it's a healthy birthday cake? I guarantee this is one cake you'll have no problem with when your little ones are asking you for second and third helpings! 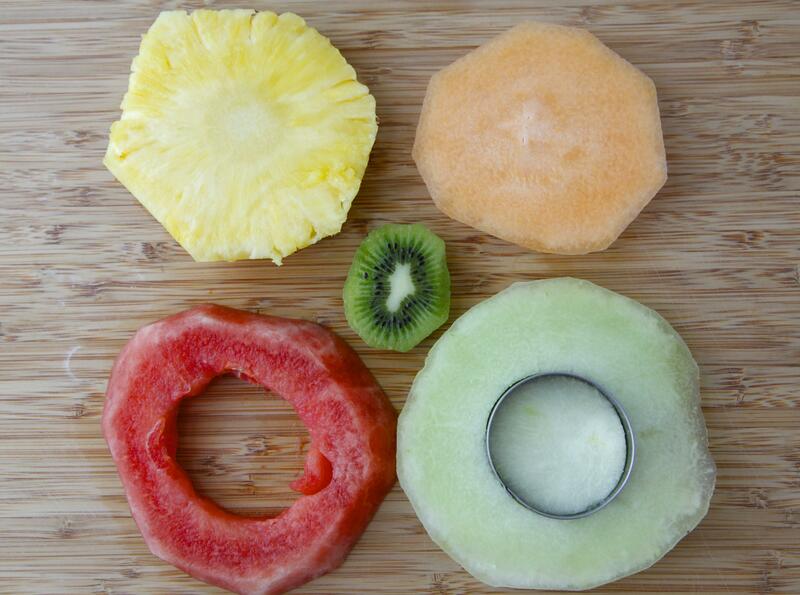 First slice your fruit, stamp or cut out the center and start stacking! 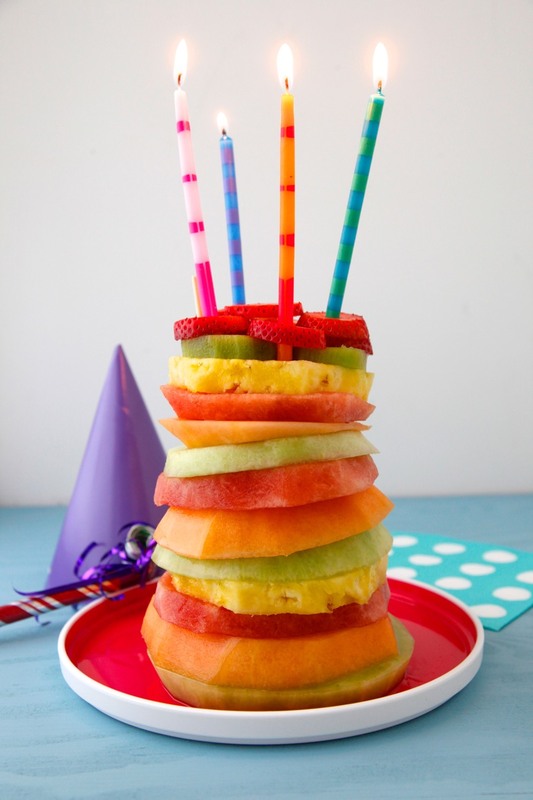 Placing wooden skewers through the cake holds everything together and prevents the fruit from sliding over! Gently push the sticks in and voila! 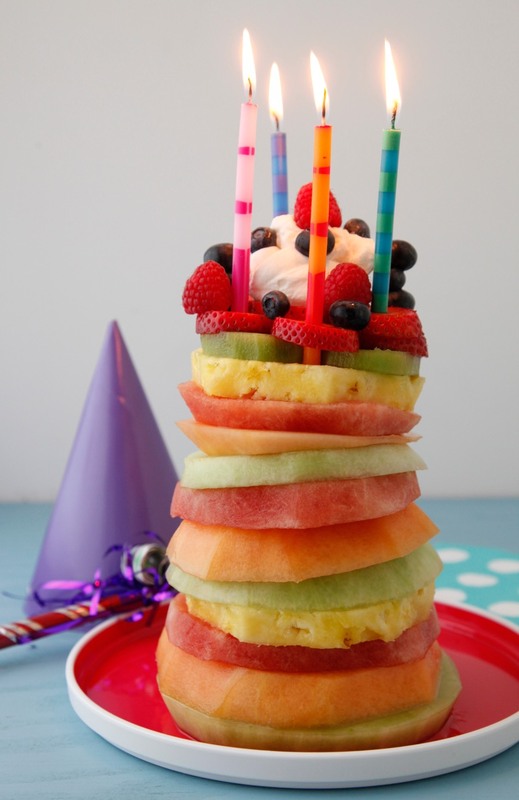 You have a Fruit Tower Birthday Cake! 2. 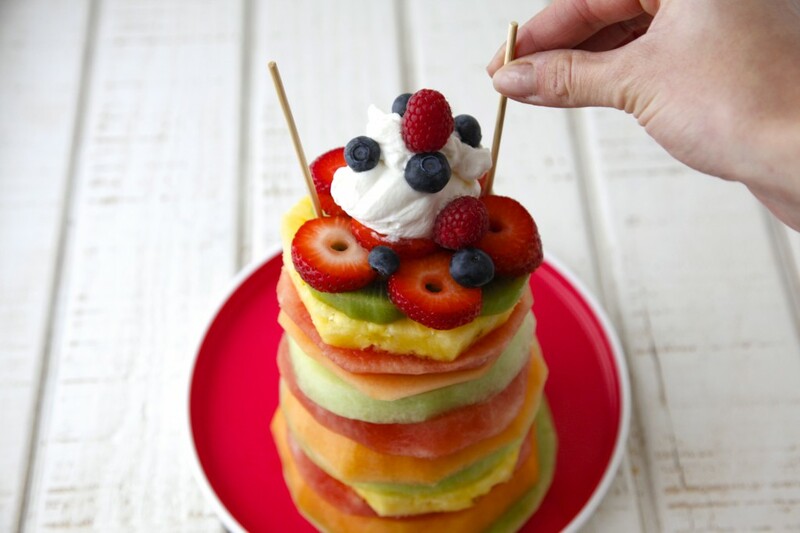 Stack the sliced rings of cantaloupe honeydew, watermelon and pineapple alternating. If slices are too large, trim the edges to be as even as possible. 3. 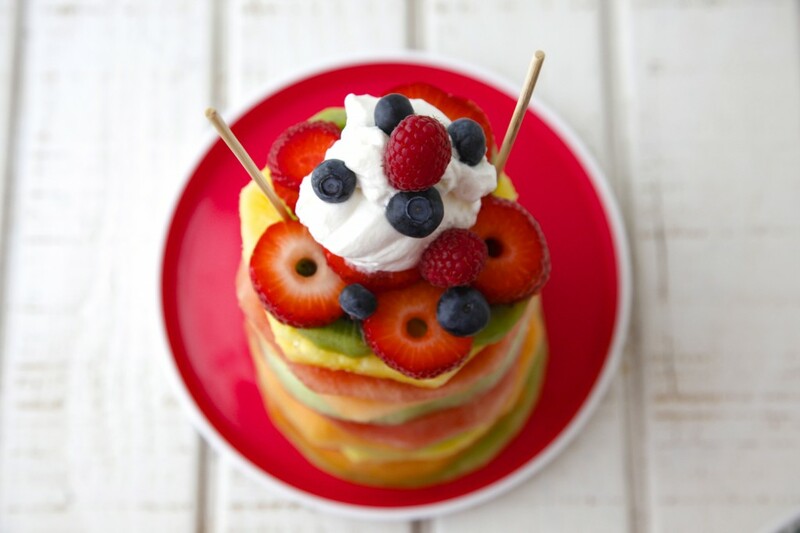 Place kiwi and strawberry slices on the top. Using 2 skewers pierce through two sides of the stack to hold in place. 4. Whip cream and sugar and place a generous amount over the top of the “cake”. Place raspberries and blueberries over the whipped cream. 5. Slice the “cake” and serve with additional berries and whipped cream. Real Babies DO Eat "Quiche"
Yum! 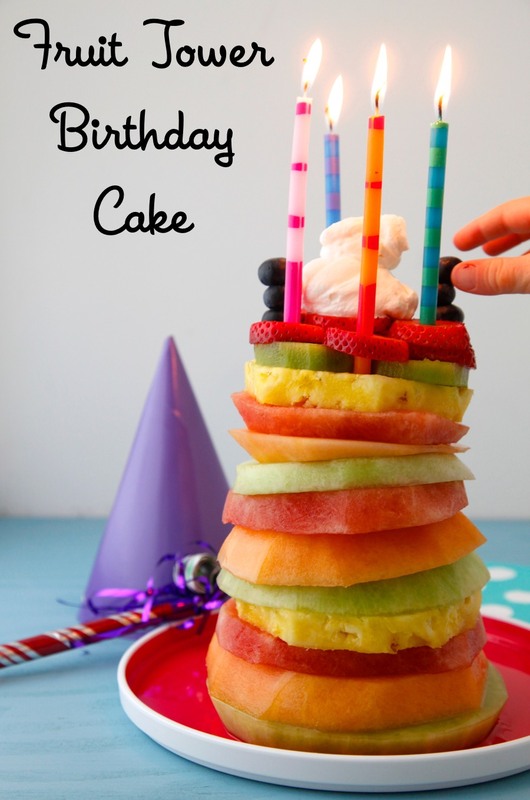 Definitely my type of birthday cake, too! So simple, yet elegant. It reminds me of those fruit bouquets that are popular, but oh so expensive. I'm going to give this cake a try! I would love to see a picture on Instagram or twitter. Just put @weelicious so I can see it! Yes Yes! I am making something like this for my baby's 1st birthday on Saturday! You are one smart cookie! Or should I say one smart fruit cake.....wait a minute. Anyway, love it! I adore this. My daughter's birthday is next weekend and we are doing this! Thanks for the inspiration. Health! I am definitely making this cake for my baby's birthday this week❤️.. wonderful idea.. thanks to you..